What is the theme for burning main 2019? That time of year has arrived when Burning Man announces its theme for the coming year, and burners from all over the world prepare to make the trek to Black Rock City, Nevada. This year, the event will be especially self-conscious of its ritualistic significance because in 2019 the theme of the festival is Metamorphoses. Burning Man is routinely described as transformative. At the personal level, a transformative experience. At the group level, a transformative event or culture. For me it was this and so much more, never have I been around 70,000 open minded, nonjudgemental individuals. I truly felt different leaving my first burn I never thought of it as a metamorphoses but I did change that first time and every-time after I come home to Black Rock City. How do you get drinks at a bar if they don’t take money? The only thing you can purchase at BurningMan is ice and coffee. For drinks noone will ask you for money you just need to make sure you have your ID. Camps will I, I bought the cups below and photocopied my license and taped the copy to the cup so I always had a copy of my id handy. How long are lines to get into Burning Man? If you can’t buy stuff at Burning Man, can you leave and come back with stuff? Is there a hospital or emergency room available near Burning Man? Since 2011, Burning Man, the organization, has contracted with Humboldt General Hospital in Winnemucca, Nev., to staff and equip Rampart Urgent Care, a field hospital that offers X-rays, ultrasounds, a hand-held head scanner, lab tests and a pharmacy. The single-room wooden structure is painted hot-pink and yellow; the walls of the waiting room are scrawled with random thoughts and thank-yous from patients. The hospital’s 40 beds are located in adjoining tents. With the nearest regional hospital either a $6,500, two-hour drive or a $26,000 helicopter ride away, medical staff are responsible for more than they would be off the playa. At Rampart, physicians don’t see every urgent care patient; instead, EMTs or paramedics are, for example, tasked with deciding if a patient needs an X-ray. X-rays are read by ED physicians, not radiologists. Is there cell phone or WIFI at Burning Man? What can kids do at Burning Man? What is a Burner Profile? Whats the best way to have electricity in Black Rock City? How do I prevent my bike fro being stolen? Can I have a POD or locker delivered to Burning Man? 1. You can make arrangements to meet your delivery at the main Gate located at the front entrance of BRC. Since there isn’t reliable phone or Internet access in BRC you’ll need to make a specific plan with your service provider well before you leave for the playa. You will either need to transfer the delivery at the Gate and bring it in yourself or make sure the delivery driver has a ticket to allow them onto the event site. You will need to have your ticket stub with you whenever you are near the front Gate of the event. 3.Your driver may buy a one-time use refundable delivery ticket at the Box Office of the event. Please note the driver themselves must pay for this ticket with their credit card – it cannot be paid for in cash or by the delivery recipient. The ticket is only refundable if returned within six (6) hours of the sale. Can I just get a day pass? Burning Man does not offer single day or weekend tickets. Burning Man is an experiment in a temporary community. Relationships are created, neighbors meet one another, and our collected survival is challenged. This is not a spectator event. It is difficult for you to take a role in the community if you are in Black Rock City for less than 24 hours. In order to experience the true essence of Burning Man, you will want to become part of the community. Therefore, there are no day passes sold, and no discounts given based on the length of stay. Tickets are good for the entire eight-day event, but you may attend as many of those or as few days as you wish. How do I purchase a Burner Express ticket? Burner Express tickets can be purchased from the Burner Express Website. Only one bus ticket can be purchased at a time so if you purchased two Burning Man tickets and would like to buy two bus tickets you will need to go through the purchasing process twice. Once you have purchased your trip TO Black Rock City, you must then purchase your trip FROM Black Rock City. The name on the Burner Express Bus ticket must match the person riding the bus. Burner Express Bus riders will again be able to purchase the water in advance and collect it on arrival. In addition, riders taking Saturday buses pre event will qualify for early entry without needing a Work Access Pass. What is considered low income for tickets? Around 4000 tickets will be made available for purchase at $190 each for those with limited income. These tickets are non-transferable and are only available through application. Applications for the Low Income Ticket Program opens at 12 pm noon PST on Wednesday, February 15, 2019, and closes at 12 pm noon PDT on April 17, 2019, or once there are enough applicants. When applying do not fill out the application on a mobile device. Use the latest version of your browser but do not use Internet Explorer. You may only apply once per email address. It takes up to 12 weeks to review applications that are submitted. Make sure to check your emails spam and promo folders for possible missed updates. You will be notified about your application status whether you are approved or denied. If you have already purchased a ticket through previous sales then you will not be able to purchase a Low-Income ticket. Go to the Low Income Ticket Page once we begin accepting applications on February 14, 2018. We will stop accepting applications on Monday, April 16, 2018 unless we reach our max capacity before then. Wait by your email with baited breath for up to eight (8) weeks while we review your application. We’ll notify you if your application is approved or denied. If you haven’t heard from us after eight (8) weeks of submitting your application, feel free to email us from the email address you used in your application at lowincome@burningman.org to check up on your status. 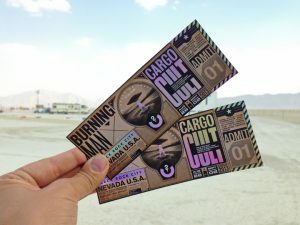 Tickets awarded through the Low Income Ticket Program are held for Will Call delivery and paid for upon pick up at the event Box Office located at the front gate of Burning Man. Whats the STEP ticket program? The Secure Ticket Exchange Program, or STEP, is a program that the Burning Man official website offers to help those who want to resale their tickets and those who want to purchase tickets reliably. All tickets and vehicle passes that are sold through STEP are sold at face value, $425 for tickets and $80 for vehicle passes plus taxes and fees. As with all things for Burning Man you must register through your Burner Profile. Registration for sellers for $425 tickets begins at 12 noon PDT on Wednesday, April 12, 2019. When you submit your ticket to the STEP process, you will then be given instructions on how to also submit vehicle passes. Tickets will not be eligible for STEP once it has begun the delivery process. The final day to submit tickets into STEP is Tuesday, May 31, 2019. For those with Will Call tickets the final date to submit tickets into STEP is Monday, July 17, 2019, at 12 pm noon PDT. Sellers will be refunded once the ticket is sold. The money will be refunded to the card originally used to purchase. When can low income tickets be purchased? Low Income tickets are not necessarily purchased out right. Those wanting to purchase a ticket must first complete a Burner Profile and then submit an application. Financial documentation may be required. The Burning Man organization then reviews and selects individuals allowing them to purchase the tickets. Burning Man Low Income Ticket Hub provides further information on the program. How often do Burner Express buses run? Whats the fastest way to get into Burning Man?